The China International Import Expo (CIIE) is set to improve people’s lives in a myriad of ways, by opening up the market and bringing foreign countries in closer connection with China. Many of these will have trickle-down impacts on quality-of-life, by upgrading business processes and capital, but one that is set to have a very direct impact is Shanghai Takashimaya. This company brings the best of Japanese quality right to the Chinese consumers. 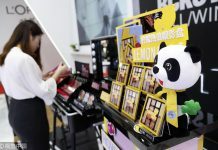 Soon you will be able to acquire these refined lifestyle items with the same ease you would expect from shopping for anything else in the fast-paced China market. Komori Tomoaki is the president of Shanghai Takashimaya, and offers us a look into the win-win situation for the company and the consumers that is brought about through the magic of the CIIE.